The properties of woody debris (WD) vary across different forests under various soil conditions. Owing to the relatively shallow and low amounts of soils on karst terrains, it is necessary to determine the WD carbon inventory of karst forests. In this study, we recorded WD with a basal diameter for standing snags and the large-end diameter for fallen logs of ≥ 1 cm. The carbon density of WD in a secondary karst mixed evergreen and deciduous broad-leaved forest that had been clear-cut 55 years ago in southwestern China were inventoried in a 2 ha plot. Woody debris carbon density calculated using specific gravity and carbon concentration was 4.07 Mg C ha−1. Woody debris with diameters ≥ 10 cm (coarse WD) constituted 53.8% of total carbon storage whereas WD < 10 cm in diameters (fine WD) accounted for more pieces of WD (89.9%). Lithocarpus confinis contributed the most WD carbon (26.5%). Intermediate decayed WD was relatively more abundant, but WD with final decay contributed the least to the total pieces of WD (6.7%). The contribution of WD to carbon storage of karst forest was low compared to other forests worldwide. Significant positive correlations were found between WD carbon and biodiversity (R2 = 0.035, p < 0.01) and elevation (R2 = 0.047, p < 0.01) and negative correlations was found in outcrop coverage (R2 = 0.034, p < 0.01). 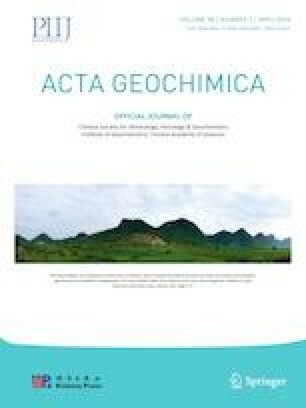 Further studies are needed to elucidate the ecological functions of WD to better understand their roles in maintaining biodiversity, enhancing productivity, and controlling vegetation degradation in karst forest ecosystems. The online version of this article ( https://doi.org/10.1007/s11631-019-00339-9) contains supplementary material, which is available to authorized users. This study was financially supported by National Natural Science Foundation of China (31870462), National Key Research & Development Program of China (2016YFC0502304 and 2016YFC0502101).